File photo by Travis Rosenau From this Nov. 24, 2018, file photo, Sleepy Eye St. Marys’ Cassie Heinrichs drives to the hoop in a home game against Cleveland. Heinrichs scored her 1,000th career point on Monday night against AC/GE. 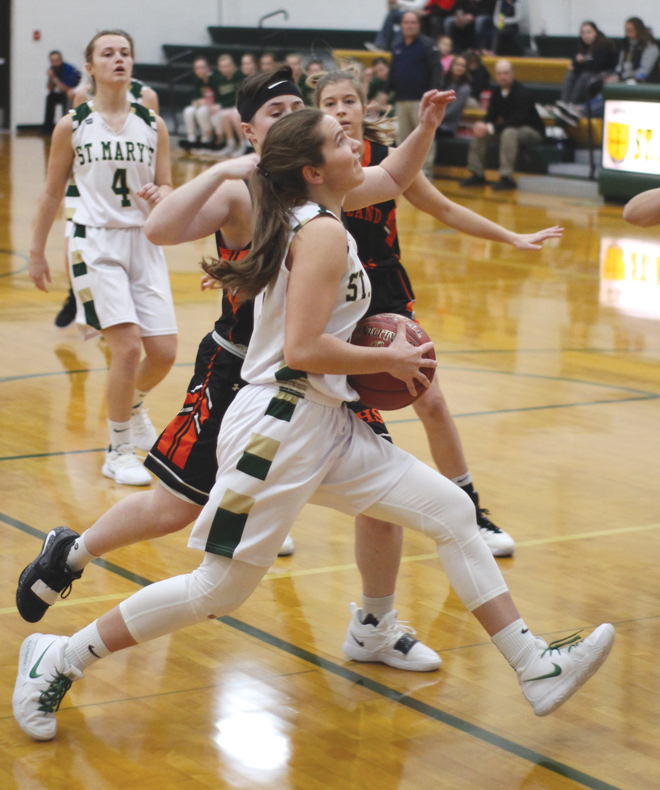 SLEEPY EYE — When Sleepy Eye St. Mary’s squared off against Alden-Conger/Glenville-Emmons for a nonconference girls’ basketball game Monday night, there was a chance for Knights senior Cassie Heinrichs to reach an impressive milestone. Needing 15 points for 1,000 career points, Heinrichs reached the milestone in the second half of a 67-55 hard-fought win. After Heinrichs dropped in a 3-pointer from way out at the 4:35 mark in the second half, she was a single point away from the career accomplishment. Heinrichs 3 came in her normal fashion as she drained the bucket and lifted her team to press on. Alden-Conger was then called for a foul on its offensive side of the court, which brought Heinrichs to the line for the one-and-one bonus as the Sleepy Eye Fieldhouse went silent. The Silence did not last long as Heinrichs netted her first free throw and immediately embraced the basketball before finding her mother in the crowd. “It is everything that I have ever wanted since I was 8 years old, this is a dream come true,” Heinrichs said on her career mark. Heinrichs is the ninth St. Mary’s player to reach this accomplishment. Alden-Conger ran away with an early 8-2 lead when Heinrichs netted an early bucket as St. Mary’s struggled to gain composure. Madison Mathiowetz brought St. Mary’s with in 1-point by netting consecutive baskets down low. St. Mary’s Liz Schwint drained a deep field goal to tie the game at 21-21 with under two minutes left in the first and the score remained tied into the half. St. Mary’s led the charge in the second half when Sydney Windschitl netted 12 points with eight minutes still left in the second half. Windschitl, Heinrichs and Mathiowetz tallied the points for the Knights in the second half. St. Mary’s began to put the ball game away with a blocked 3-pointer which turned into an easy layup for Mathiowetz and the 55-44 lead with under six minutes left to play. Mathiowetz led St. Mary’s with 30 points, Heinrichs tallied 19 points and Windschitl netted 16. St. Mary’s (12-7) will host Lake Crystal-Welcome Memorial at 6 p.m. Tuesday.